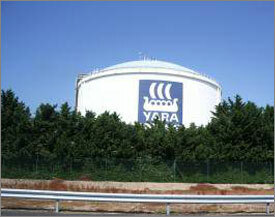 The new terminal has been names Yara Fertiliser Terminal. It is expected to improve the availability of fertilisers in the country, by making them available in small packages that are well categorised, based on specific needs of different farmers. "It is expected to benefit smallholder farmers by giving them access to high quality products at competitive prices," said Monica Maeland, Norway's minister of trade and industry during the recent launch of the terminal. The terminal has a handling capacity of 150,000 tonnes of fertiliser annually. It will also boost commerce at the Dar es Salaam port, one of the gateways to the East Africa region, by providing it with extra capacity. The fertiliser terminal was a result of a joint venture between Norfund, Norway's organ for fighting poverty in developing nations, and Yara International (Yara), one of the largest producers and marketers of mineral fertilisers in the world, and headquartered in Norway. The new terminal is part of the larger Southern Agricultural Corridor of Tanzania (SAGCOT) launched by Yara seven years ago. It aims at enhancing food production in underutilised areas while securing inclusive growth in the agricultural sector.